Quarterly spend on all data centre hardware and software has grown by just five per cent during the past 24 months, while spending on the public cloud portion of that has grown by 35 per cent. According to new data from Synergy Research, the private cloud infrastructure market has also grown, though not as strongly as public cloud, while spending on traditional, non-cloud data centre hardware and software has dropped by 18 per cent. Meanwhile, original design manufacturers (ODMs) in aggregate account for the largest portion of the public cloud market, with Cisco being the leading individual vendor, followed by Dell EMC and Hewlett Packard Enterprise. 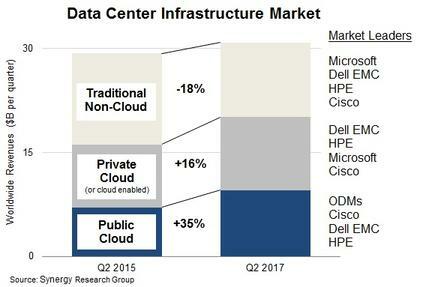 The second quarter market leader in private cloud was Dell EMC, followed by HPE and Microsoft, with the same three vendors leading in the non-cloud data centre market, though with a different ranking. “With cloud service revenues continuing to grow by over 40 per cent per year, enterprise SaaS [software-as-a-service] revenue growing by over 30 per cent, and search/social networking revenues growing by over 20 per cent, it is little wonder that this is all pulling through continued strong growth in spending on public cloud infrastructure,” Synergy Research chief analyst and research director John Dinsdale said. “While some of this is essentially spend resulting from new services and applications, a lot of the increase also comes at the expense of enterprises investing in their own data centres. Total data centre infrastructure equipment revenues, including both cloud and non-cloud, hardware and software, were over US$30 billion in the second quarter, with public cloud infrastructure accounting for over 30 per cent of the total. 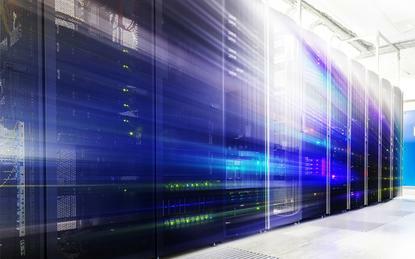 According to Dinsdale, private cloud or cloud-enabled infrastructure accounted for over a third of the total. “By segment, HPE is the leader in server revenues, while Dell EMC has a strong lead in storage and Cisco is dominant in the networking segment,” Dinsdale explained.